At the beginning of September, precisely on September 2nd, we crossed borders from Colombia to Ecuador. We took a bus to the borders, and despite a fact that is seemed crowded at first sight, the whole procedure was smooth and took less than 2 hours. Nowadays, the border crossing is considered safe the only problem can be a large number of people from Venezuela who try to escape the country. Fortunately that morning everything went without a problem. Our first stop behind borders was town Otavalo. It is known for its indigenous markets, and although we found those markets rather touristy, we enjoyed walking around the city among women who still dress traditionally and men who wear long braided hairs. The highlight was a visit to Laguna Cuicocha only a few kilometers from Otavalo. Then we transferred to Latacunga, not a very interesting city, but it was a starting point for the most famous trek in Ecuador, Quilotoa Loop. Before we got to Latacunga, we had to change buses in Quito, and here we ensured that rumors we've read about thieves on bus stations are true. Once we got on the bus, two suspicious men tried to "help" us with our hand luggage where we keep our valuables and wanted to steal it. Luckily, we were aware of their wrongdoing, and they left unsuccessful. If you plan your travels in Ecuador, always keep your backpack on your lap, especially on buses heading to and from Quito. The Quilotoa Loop is a three (or more) day hike across the Ecuadorian countryside which finishes (or starts) at the Quilotoa Crater. We hiked at a slow pace, acclimatized properly, sunny weather was on our side, there were not many hikers along the trail, and overall, we had a great time. The only downside on this trek was begging children and strayed dogs - if you plan on hiking this loop, have a stick in your hands and a few rocks in your pocket just in case. Also, one night we experienced rather a strong earthquake, but the epicenter was further south so thankfully we were safe. We also compiled article on why to trek Quilotoa Loop and things to know before you go. When we got back to Latacunga, we decided not to visit Cotopaxi National Park - we saw the Cotopaxi volcano many times from the town (our hostel actually had a great view from sun terrace), and also we did not like tours travel agents in the town were offering. Another destination was Mindo. A small town which is famous for an incredible number of bird species. One day we took a cable car across a river valley and from there we hiked a short trail along the route with several waterfalls. We also visited a chocolate factory, where we learned a lot about the process of making chocolate (and also, of course, tasted some). In Mindo, we attended great night walk tour in the jungle with a guide from Canada who moved to Ecuador and specifically to Mindo because it is a perfect place for someone like him who studies frogs and other species. It was after the rain, and we saw many frogs, bugs, bats and even snakes. Also, the tourist season in Mindo just ended so this tour was private only for two of us as no one else joined us. 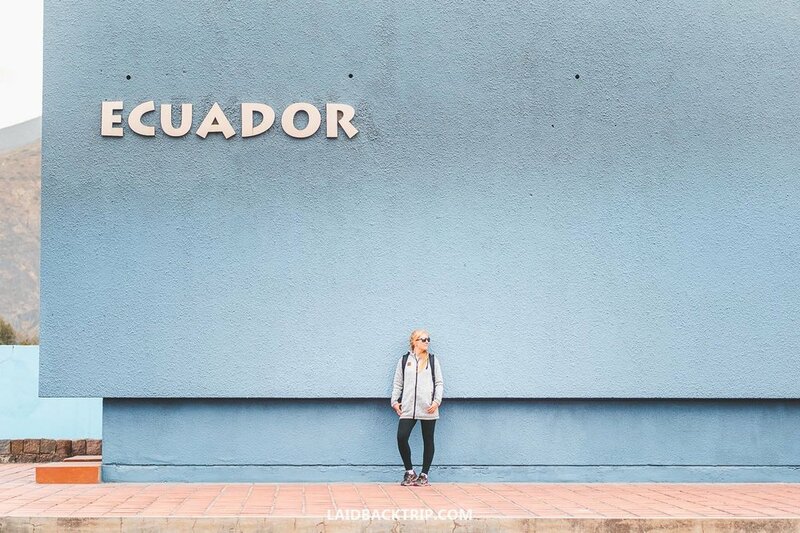 From Mindo, we took a bus to the capital city of Ecuador, Quito. We spent here four days, and despite its bad reputation we quite liked it there. Quito has a nice historical center, cool Guayasamin's museum and many viewpoints around the city. Quito lies 2850 above sea level, and with many hills and volcanoes around, it is easy to escape the polluted city. When you are looking at the map, you might wonder, why we traveled the way we did, because it did not make much sense. There was a reason. On September 16th we had flight tickets to the Galapagos Islands - the absolute highlight of our travels in Ecuador. Galapagos Islands has always been a destination we wanted to visit, and finally, this dream came true. We spent eight amazing days on board of M/Y Eric with Ecoventura and our only concern over these eight days was to explore, photograph, swim and eat. This collaboration with Ecoventura has been the biggest one we've had, and we hope it will have a positive impact on our blog in the future. When we arrived in Quito, we had to quickly get back to our reality. I did not mention that before the Galapagos, we went to a second-hand shop and bought an underwater camera. Of course, we did not get any receipt as the camera was most likely stolen. When we arrived to Galapagos, the camera did not work (although it did in the store), there was most likely a problem with a battery, so when we arrived back to Quito, I had a pleasure to go to the store and complain. With my poor Spanish (almost non-existent) and salesman even poorer English, it was not easy to explain what I want, but probably from my not friendly attitude, he understood that there is something wrong. Then, with my last sentence - I paid ochenta and want sesenta back - he gave me back $60. The other day we took a bus to Banos, a place is known for cycling, hiking, waterfalls, lush green hills, a popular tree house with a swing and hot springs. We did a bit of everything while working on our photos and post about the Galapagos. The end of September found us in Riobamba, a city near the highest Ecuadorian mountain, Chimborazo. Here, we have another two clients we will cooperate with and can't wait for it as it will be new and different again. When writing this post, we just received a super-positive review from our August collaboration with Paramo Trek, when we hiked in Los Nevados NP. They also let us know that thanks to our article they received some bookings already, which really made our day and it reassured us that our energy and time we put into our blog make sense. Let's see where will October take us.